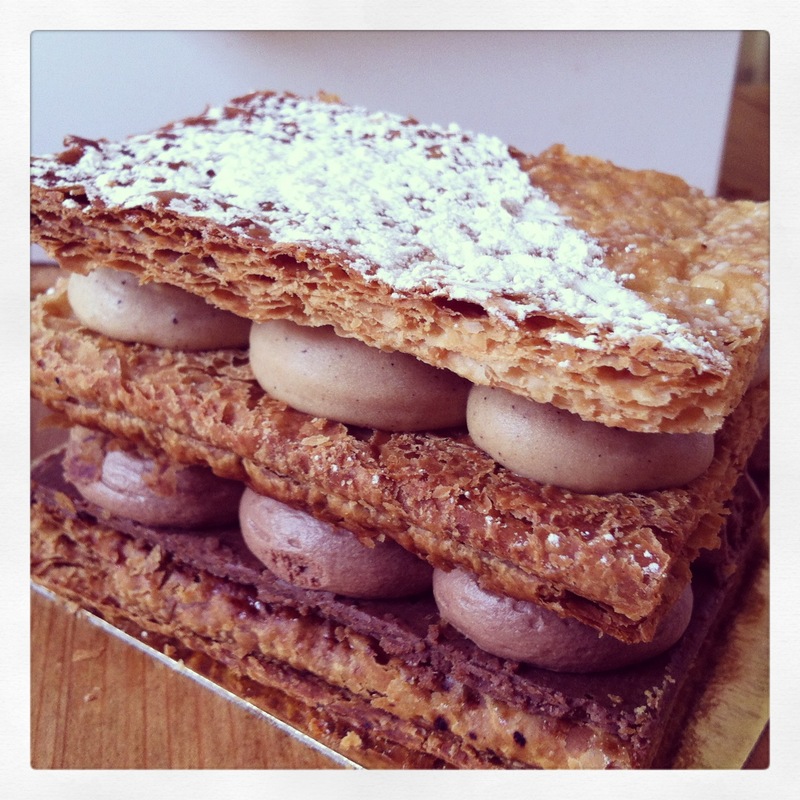 Welcome to the world of puff pastries and their thousand layers “millefeuille”. If the French are known to master anything better than anyone else, it’s this. They have an elegant way of creating puff pastry that results in flaky, crispy, buttery yet light melt in your mouth layers. How do they do it? Well, for students of Ferrandi, we finally learn the secrets this very wonderful traditional recipe, and we’re finding out that in fact, it’s still evolving. Our first lesson in the creation of puff pastries, is a technique called, Feuilletage, to create the puff pastry dough, pate feuilletee. For a pate feuilletee traditional, there are two main parts. The first part to create a dough called detrempe. The detrempe, is a mixture of greater flour to butter, [for example: flour 400g : butter 50g]. The second part, is a tablet of butter. We encase the tablet into the detrempe. 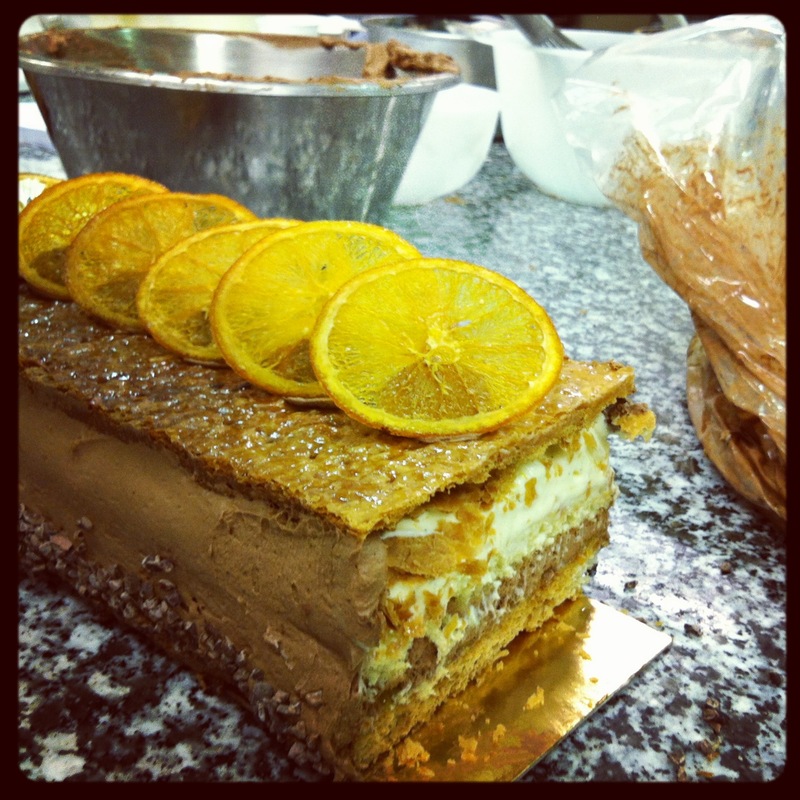 This is called a pâton. We then want to incorporate this butter into the detrempe. We have a techique called, turns, or in French, tours. It’s a technique of rolling out dough, folding it like an envelope or book, and then rolling it out again, doing this a number of times, 5 tours generally, and refrigerating between each turn, or tour. 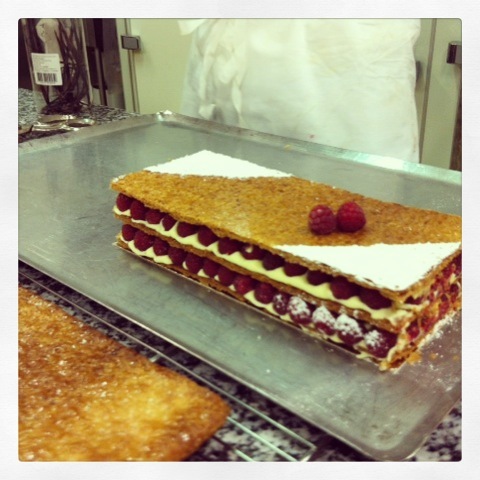 And this is how you create those layers in the puff pastry. Of course there is a more scientific answer for why the flakiness but for now this is the basic understanding. Then there’s the most celebrated method of feuilletage, the Feuilletage Inversee. It’s said that Pierre Herme evolved the modern puff pastry into something even more flaky, buttery and lighter. It’s also the method my Chef prefers, and he has good reason too. It’s the best puff pastry I ever tasted. So how do you make it? It’s like the name, you inversee or reverse the traditional method. The butter is on the exterior and you encase the detrempe in the butter. But rolling out just butter is impossible, so we need to add a minimum of flour to work with it, and this is called a beurre manie. The detrempe in the recipe for Inversee is only flour/salt and water (no butter). Now, for flavoured pate feuilletee, we do: feuilletage au chocolat and feuilletage a la pistache. We assume the role of Pate Feuilletee Inversee. Why? Because it’s the best! Feuilletage au Chocolat is a detrempe [flour/salt/water] encased into the beurre manie which has added cocoa powder. Feuilletage a la pistache is the same method, except we put pistache paste into the beurre manie. The puffing of your pastry depends on how you prepare your dough – right from the beginning when you mix the ingredients, to rolling, turning and refrigeration. There are butters for creams and butters for pastry dough, then your choice must be at the highest of quality. The choice of butter is absolutely crucial to the taste and behaviour of your puff pastry. Do not short change on ingredients when making a French puff pastry dough. You gain more by investing. Welcome to the world of puff pastries. If the French are known to master anything better than anyone else, it’s this. They have an elegant way of creating puff pastry that results in flaky, crispy, buttery yet light melt in your mouth layers. How do they do it? Well, for students of Ferrandi, we finally learn the secrets this very wonderful traditional recipe, and we’re finding out that in fact, it’s still evolving. 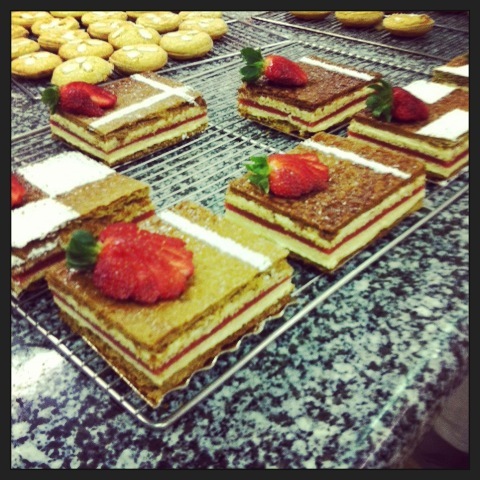 For a pate feuilletee traditional, there are two main parts. The first part to create a dough called detrempe. The detrempe, is a mixture of greater flour to butter, [for example: flour 400g : butter 50g]. The second part, is a tablet of butter. We encase the tablet into the detrempe. This is called a paton. We then want to incorporate this butter into the detrempe. We have a techique called, turns, or in French, tours. It’s a technique of rolling out dough, folding it like an envelope or book, and then rolling it out again, doing this a number of times, 5 tours generally, and refrigerating between each turn, or tour. And this is how you create those layers in the puff pastry. Of course there is a more scientific answer for why the flakiness but for now this is the basic understanding. The puffing of your pastry depends on how you prepare your dough – right from the beginning when you mix the ingredients, to rolling, turning and refrigeration. There are butters for creams and butters for dough, you must choose accordingly. Also, the choice of butter is absolutely crucial to the taste and behaviour of your puff pastry. Do not short change on ingredients when making a French puff pastry dough. You gain more by investing. Creating puff pastry requires a French method of feuilletage, that is, layers of pastry leaves by the use of “turns”. And Pâte Feuilletée is the puff pastry itself. Dissolve salt in water and add water to the center of the well. Mix the flour and water gradually. Knead without giving body to the dough. Make the dough into a ball and cut an “X” into the top with a knife. Soften the second quantity of butter and form it into a square. 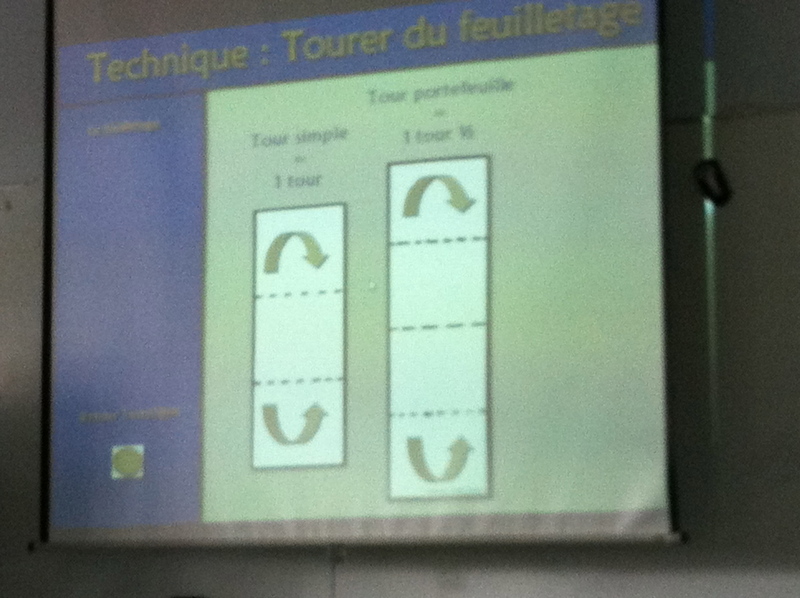 Give either two simple turns (=2 folds) or two double turns (=3 folds) to the pâton. Let the pâton rest for a minimum of 30 minutes in the refrigerator. 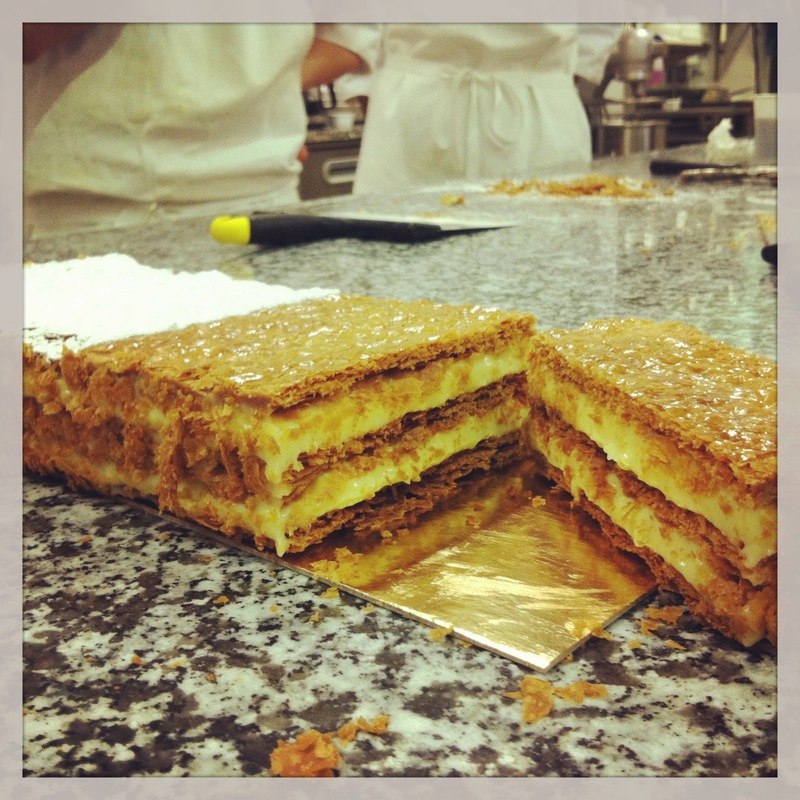 This recipe is sourced from the student class recipe book, Anglophone Patisserie 2013, created by Chef Patissier, D. Averty of l’ecole FERRANDI . The recipe can be subject to change at the discretion of the Chef or any other Chef at any time. The success of this recipe depends on a number of factors such as the quality of ingredients, temperature and quality of appliances, temperature of the kitchen, skill of the student and/or patissiere and timing. This recipe does not include additional notes taken by miss pirisi at the time of making the recipe.